“What we’re trying to do is develop a more personalized medicine for men with prostate cancer,” said James L. Mohler, MD, associate director and senior vice president for translational research, Roswell Park Comprehensive Cancer Center, during a presentation at the 2017 NCCN Annual Conference. Risk stratification by family history is also emphasized, “and for the first time we finally know what a strong family history is,” Mohler said. A brother or father or multiple family members diagnosed with prostate cancer before age 60 constitutes a strong family history. “Now we’re learning more about the need to identify DNA repair gene abnormalities and also to search for Lynch syndrome, which is something that most urologists probably weren’t familiar with until recently,” he said. Prostate cancer guidelines are needed because overdetection leads to overtreatment. Additionally, financial incentives are such that providers are rewarded for imaging studies and treatment, and new agents treating castration-resistant prostate cancer are expensive and their optimal sequence of use is uncertain. The cost of treatment for castration-resistant disease to add 2 years of survival is about $1.3 million, so the financial burden is substantial, said Mohler. Estimating life expectancy is important for molecular testing and treatment decisions, especially in low-risk groups. The estimation is possible by using life insurance or Social Security Administration life expectancy tables, and adjusting the finding for individual patients by adding or subtracting 50% based upon whether one believes that the patient is in the healthiest or unhealthiest quartile, respectively. In low-risk or very low-risk prostate cancer, immediate treatment is rarely needed, said Mohler. Prostate cancer is a slow-growing tumor, “and if we continue to treat men who have slow-growing prostate cancer, you’re not going to help, but we cannot ignore the rapidly growing high-risk potentially fatal cancers,” he said. Several studies have shown that there’s no harm in treatment delays of up to 2 years. “We have this window of opportunity to follow patients carefully and select those who actually need to be treated from among the majority who do not,” Mohler said. Retrospective studies have shown that molecular assays of tissue from prostate biopsy or radical prostatectomy provide prognostic information independent of NCCN risk groups. These assays are fairly good at predicting the likelihood of death with conservative management, the likelihood of biochemical progression after radical prostatectomy or external beam therapy, and the likelihood of developing metastasis after radical prostatectomy or salvage radiotherapy. Mohler noted that mutations in homologous recombination genes—particularly BRCA1/2, ATM, PALB2, and FANCA—can be found in 6% of men with high-risk prostate cancer, and in 11.8% of men with metastatic prostate cancer. Men with a positive test should be referred for genetic counseling, he advised. The results have treatment implications in that men with a positive genomic test may be considered for earlier use of platinum chemotherapy or referral for clinical trials in which PARP inhibitors are being tested. DNA analysis for microsatellite instability (MSI) and immunohistochemistry for mismatch repair deficiency (dMMR) should also be considered. If either is found, the patient should be referred to a genetic counselor to assess for the possibility of Lynch syndrome and potential use of treatment with pembrolizumab (Keytruda) once androgen deprivation therapy (ADT) fails. In advanced disease, PET/CT imaging can be used to evaluate men who have had biochemical recurrence or the possibility of metastatic disease. “The 2 main tests for which there are good data are C-11 choline and 18-F fluciclovine,” Mohler said. Overall, the tests do not have adequate sensitivity until the prostate-specific antigen (PSA) reaches a level high enough that treatments may not be beneficial, he added. In castration-naïve patients, complete androgen blockade “does not work,” Mohler said. Intermittent ADT appears to be as good as continuous ADT on the endpoint of overall survival (OS) with a significant quality-of-life benefit. Intermittent ADT can be personalized based on the PSA response, he indicated. A PSA that falls to <0.2 ng/mL, for example, signals an outstanding response to ADT and a patient who will do well off ADT for a prolonged period, with a median survival of 75 months. For younger and healthier men with metastatic castration-naïve prostate cancer, survival is improved with the addition of docetaxel (Taxotere) to ADT. Abiraterone acetate (Zytiga) is a less toxic alternative to chemotherapy with a similar effect on survival; the combination of ADT and abiraterone with prednisone has a category 1 recommendation in the guidelines. “This has produced a change in the NCCN guidelines where we make more options available for castration-naïve disease,” Mohler said. “If the patient is asymptomatic, I always use intermittent ADT. I discuss a possible decrease in overall survival but the trade-off is improved quality of life during off cycles,” he added. Continuous ADT can be considered for men with symptomatic castration-naïve disease unless the PSA response is outstanding, in which case intermittent ADT is preferred. For patients with nonmetastatic (M0) castration-resistant prostate cancer, apalutamide (Erleada) was recently shown in the SPARTAN trial to provide a 2-year benefit in metastasis-free survival compared with placebo in men with a PSA doubling time ≤10 months, at a cost of an increase in pathologic fracture to 11.7% from 6.5% in the placebo group.2 Whether the delay in the development of metastatic disease will translate to an improvement in OS will require longer follow-up. The newest guideline reflects this trial by adding apalutamide as an option for men with nonmetastatic disease, especially for those who have a PSA doubling time <10 months. Mohler said that with an array of options for the treatment of bone metastases and the expense of apalutamide, “you might want to reserve your apalutamide for that time when you do develop that metastasis.” Men with a PSA doubling time >10 months are instead recommended for observation. Subsequent systemic therapy (following ADT) for metastatic castration-resistant prostate cancer has become more complicated, Mohler said. In 2018, the NCCN panel differentiated between visceral and skeletal metastases for the purpose of selecting therapy. For patients without visceral metastases, options include abiraterone with prednisone, docetaxel, enzalutamide (Xtandi), and radium-223 (Xofigo) for symptomatic bone metastases—all of which have a category 1 recommendation. Further options include referral to a clinical trial and other secondary hormone therapies. For patients with visceral metastases, the guideline recommends consideration of biopsy and basing subsequent therapy on histologic evidence of small cell carcinoma or adenocarcinoma, according to the guideline. All treatment strategies for castration-resistant prostate cancer exceed the commonly assumed societal willingness to pay a threshold of $100,000 per life-year saved, noted Mohler. From the patient perspective and a health economist’s perspective, therefore, “we need to do better at how to use these,” he said. Improvements in cost per life-year saved requires price reductions or enhanced survival with combinations or sequences using new agents. To do this requires clinical trials looking at sequencing and better biomarkers of response to answer ongoing questions in the field. A molecular assay that identifies high MSI or dMMR in a symptomatic patient can indicate eligibility for pembrolizumab instead of chemotherapy in later lines of treatment, for example, and DNA repair mutation analysis may identify patients eligible for enrollment into a clinical trial of a poly (ADP-ribose) polymerase inhibitor. “This is something we should be thinking about,” he added. 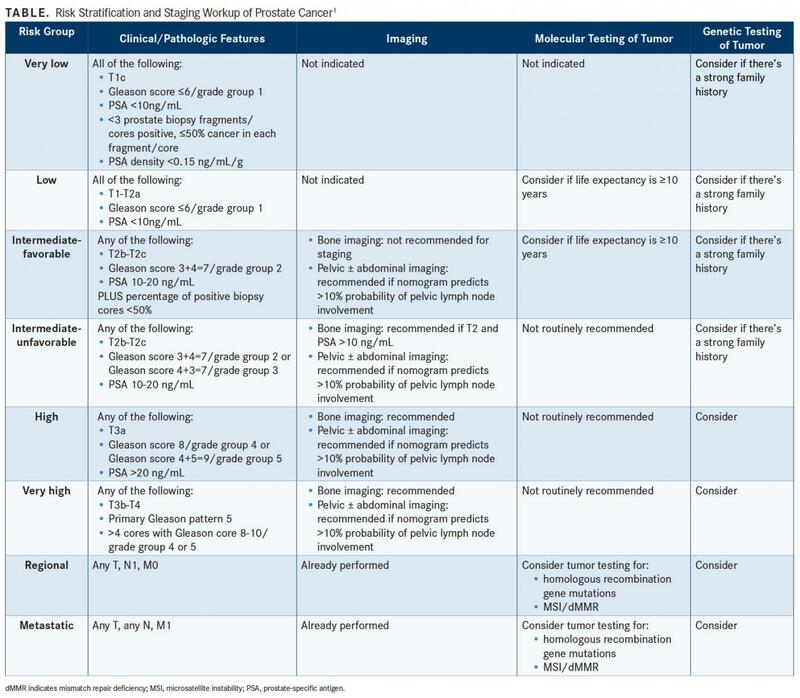 NCCN Clinical Practice Guidelines in Oncology (NCCN Guidelines): Prostate Cancer, version 2.2018. National Comprehensive Cancer Network website. www.nccn.org/professionals/physician_gls/pdf/prostate.pdf. Published March 8, 2018. Accessed March 22, 2018.